There is something within me that finds self-consciously quirky films abhorrent. They're the type of films that know they are a bit offbeat so they embrace their 'uniqueness' in obvious ways: be it through camera angles, the visuals, or those damn voiceovers (longtime readers know I am passionately against most voiceovers with certain exceptions: Sunset Boulevard, Blade Runner). Beginners has those, but I can forgive most of that due to some good performances and a heartfelt story (though I emphasize I can forgive most, not all). Oliver (Ewan McGregor) is in the middle of an early mid-life crisis. He is dealing with many things. First, after the death of his mother, his father Hal (Christopher Plummer) tells Oliver that he's gay. Hal's alternative lifestyle, alas, lasts only four years before he too dies of cancer. Throw in a romance with the beautiful French actress Anna (Melanie Laurent), and poor Olly is not having a good life. Still, as Beginners jumps from his father's passionate embrace of his gay life (gay in every meaning of the word) and his new-and-much-younger lover Andy (Goran Visnjik) to Oliver and Anna's romance, we see Oliver grow as a person. I can't say Beginners is a bad movie. It isn't. The film is blessed with two wonderful actor who give rich performances. The interplay between McGregor and Plummer come off as an extremely affectionate one between father and son. Beginners, under the direction of Mike Mills, brings great tenderness and affection but also a slight hesitancy to their relationship. In other words, it's a realistic portrayal of a son who is still a little leery of his father, not because of Dad's newly-embraced gay life. Instead, it is due to how Oliver perceived his parent's relationship and especially Hal's remoteness from both his mother and himself. Granted, the gay thing may have played a part in it, but when McGregor and Plummer are together (especially at the end of Hal's time), it is quite tender and moving. Beginners is quite good, frankly, almost every time Plummer is on screen. Hal embraces the life he's so yearned for with more than abandon, but with an almost psychotic passion. He joins gay groups, hosts gay-themed film viewing parties (especially The Times of Harvey Milk), and gives his son a rainbow flag, telling Oliver it represents gay pride. Hal is so enthralled with being free of his constraints he is unaware that his son would know what the rainbow flag means, as if Hal has made this discovery on his own and wants to tell the world. 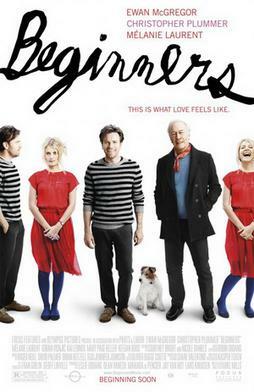 My issue with Beginners has to do almost exclusively with the other aspects of the film, in particular the romances. First, the romance between Hal and Andy never was believable. It wasn't because Andy was old enough to be Hal's son. Rather, it was because as portrayed by Visnjik, Andy never appeared to be anything other than a parody of a nitwit. If memory serves correct, at one point, Andy jumps up and down and claps like a child receiving a toy. His Beatles haircut does not help alleviate the impression that Andy is remarkably dim. If Andy and Hal did really fall in love, we got very little sense of it. Even worse was the romance between Oliver and Anna. Throughout Beginners, their affair was played as something cute: they meet at a costume party where he dresses as Sigmund Freud and she...I think she was Marlene Dietrich (though given she could not speak when they first meet, it was hard to say for sure so I'm going by the fact that she was dressed as a man). They roller skate down the hotel lobby, he takes her tagging (seriously, two adults creating graffiti: at least they weren't making gang signs, so that's a plus). This I blame more on the script than the directing. However, the writer was Mike Mills himself. To my mind, he put in too many things that were a bit too 'cutesy': the 1920s-style music, endless montages of "what the stars looked like, what the President looked like" to emphasize the changing times. One particular moment did get me: when Oliver hears the doctor found a spot on Hal's lung the size of a quarter, we see a quarter, then five nickles, twenty-five pennies. I'm not a fan of films that draw too much attention to how clever they think they are. In short, Beginners delights in its own whimsy, but things like that take me out of the story and instead force me to focus on how 'witty' everyone is. Beginners has some wonderful performances from McGregor and Plummer, and at its heart a good story. If Mills had put greater focus on the father/son relationship as opposed to counterpointing it with that between Oliver and Anna (which again, was a little too cute for its own good: how many times can we be told 'this is the kitchen, this is the living room') it might have a been a truly great film. It isn't bad, and it will certainly have you think of the relationship with one's own parents (straight or gay). When one thinks of the film, it's not a bad Beginners.